Facebook, Twitter and Snapchat all reported slowing or declining users on the platforms for the most recent quarter. But Facebook-owned Instagram and WhatsApp are still growing. There's also emerging markets to consider — and Facebook may have an advantage there too. As of Tuesday, the three biggest public social media companies have reported earnings for the latest quarter, and all three reported slowing or declining users on their respective platforms. Snap reported a drop in daily active users on a quarter-over-quarter basis for the second quarter. Facebook reported a drop in monthly users on a quarter-over-quarter basis for European users, while North American users were flat. Twitter posted a small decline in monthly users on a quarter-over-quarter basis. There's also emerging markets to consider. China has blocked its billions of mobile internet users from Facebook and other popular sites for years. Facebook hasn't quite given up on entering the Chinese market yet. But it's banking on "lite," or pared down, versions of its apps to saturate huge unaddressed markets like India, Nigeria and Indonesia. And WhatsApp, which is popular outside the U.S. as the go-to encrypted messaging service, is putting up Facebook core-level numbers. Facebook CEO Mark Zuckerberg said on the company's fourth-quarter earnings call in January that WhatsApp crossed 1.5 billion monthly users. Executives haven't offered an updated count in recent quarters, but COO Sheryl Sandberg said on the most recent earnings call that WhatsApp status — just one feature of the larger app — draws 450 million users each day and surpasses daily users for Instagram Stories. Anyway, here's a look at the charts. You can decide if we're in peak social. Facebook is still on a nice upward trend for its monthly active users overall. Here are the daily active users of the core Facebook app. As you can see, there's a bit of a drop quarter to quarter, but overall, it looks pretty good for now. Facebook has said repeatedly that it plans to roll out GDPR-like controls to Facebook users globally, which could ding North American totals like they did European totals. Now, here's where it gets interesting. Twitter has essentially been flat for a while, but the company has warned shareholders that could change. Twitter has been ramping up account take-downs as it gets better at spotting fake or abusive accounts. The company says the majority of those accounts aren't active long enough to get counted in MAU totals, anyway, but it muddies the numbers a bit. Snap is at risk of going flat as well. 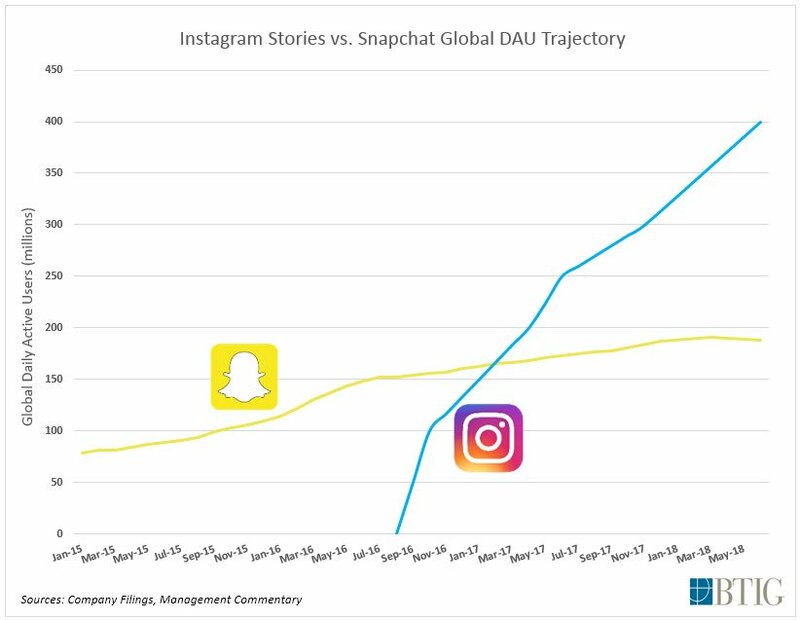 The numbers are likely hurting as users flee to Instagram's similar Stories feature, as BTIG's Rich Greenfield notes. Another win for Facebook. Disclosure: CNBC parent company NBCUniversal is an investor in Snap.